* Always On, Always Protecting. 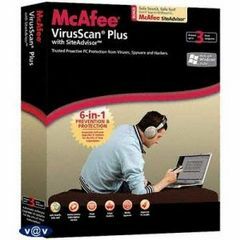 24/7 virus and threat protection from McAfee� AVERT� Labs continuously monitors worldwide virus activities and provides immediate, anti-virus protection and removal solutions. * New! McAfee� ImageAnalysis enhances content protection by protecting your family from potentially offensive content and pictures. * New! McAfee� SystemGuards watches your computer for specific behaviors that may signal virus, spyware, or hacker activity. * New! McAfee� X-Ray for Windows detects and kills rootkits and other malicious applications that hide from Windows and other anti-virus programs. * New! McAfee� SiteAdvisorTM adds safety ratings to sites and search engine results based on comprehensive spam, adware, and online scam safety tests. * Improved! McAfee� SecurityCenter makes it simple to review your computer's security status, check for updates, and fix potential security issues.